Meet MMHS Board Member Anne Morrow and learn why she loves Mandarin. A lifelong Mandarin resident and longtime board member, Anne serves as our treasurer. She is seen here in front of the Episcopal Church of Our Saviour on Mandarin Road. “Susan Ford made me,” said volunteer Anne Morrow as she reflected on the reason she is a Mandarin Museum and Historical Society board member. “Susan stopped by my house as she was literally on her way to a board meeting and told me I was going to be on the board.” Her acceptance of that opportunity led to her also agreeing to be the board’s treasurer and later a faithful volunteer docent and tour guide. Anne went on to say that she has really enjoyed being a member of the board since the early 1990’s. She said that through this group she has gotten to know some really nice people and has great memories of some of the early board meetings. “I especially remember sitting next to Carl Davis, who could always make me laugh,” she recalled. When you are a member of the board that means you will work. At least that’s the way it is at this museum. I started out volunteering at the Store and Post Office where we were open just a couple of Saturdays each month,” she said, continuing that she now loves her first Saturday morning of each month position in the Mandarin Museum. Anne’s mom, Jean Kennedy, was born at Triangle Farm just across the street from the museum, where Mandarin Presbyterian Church is now. She married Sherrod Morrow at the Episcopal Church of Our Saviour more than 75 years ago. 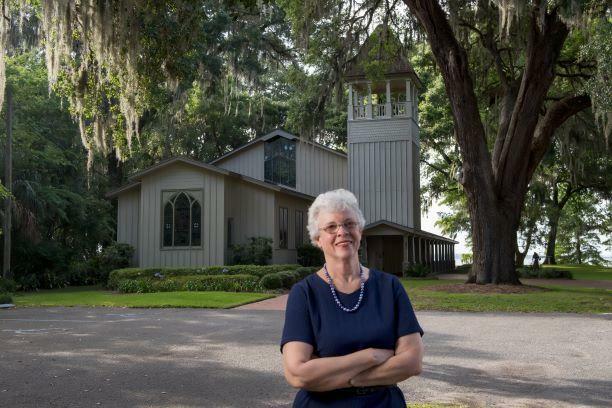 That church has played a significant role in Mandarin’s history because of its beginnings as a Bible Study at the home of Calvin and Harriett Beecher Stowe. The Morrow family remains very involved at the church. They also continue to play an important role in Mandarin’s historical significance. Anne’s brother, Bill is one of our docents at the Store and Post Office when schoolchildren are here for a tour. He shows them where the Morrows’ mail was delivered and tells them about the penny candy that welcomed them. Bill’s son, Andy, who spent several years with us as Executive Director, is a regular volunteer at our annual Winter Celebration.